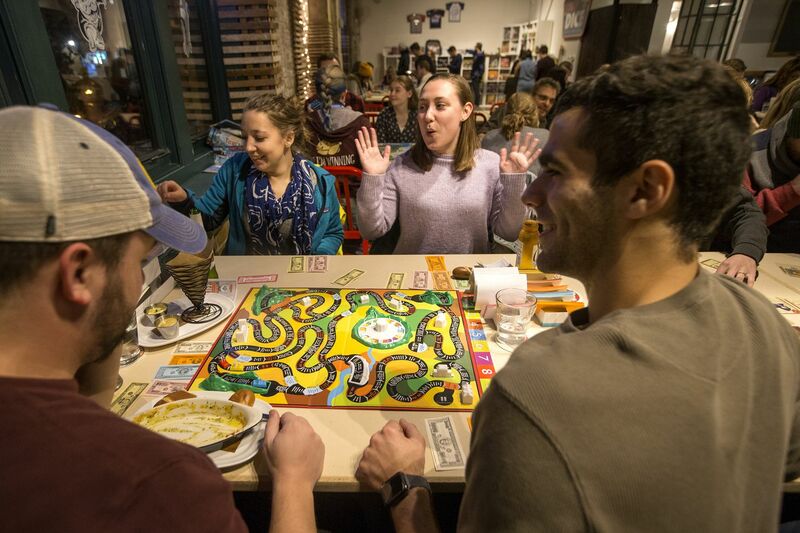 L-R: Zach Santo, Ashley Saybaugh, Liz Biron, and Shaun Dattola play The Game of Life at Thirsty Dice, a board game cafe, on Dec. 1, 2018. The forecast called for rain Saturday night — I just didn’t know it would be inside the bar. But there, in a Jumanji-like turn of events, was a sudden downpour soaking a table of gamers who jumped to their feet, beers in hand, trying to get clear of an HVAC malfunction that poured out gallons of water and sent staff scurrying with mops. It was somehow not even the most notable thing that happened over the course of my night at Thirsty Dice, Philadelphia’s first board game bar, rooted in the same nostalgia-drenched repudiation of adulthood that brought us kickball leagues, cereal restaurants, and ball pits in dance clubs. It mixes a wall of board games with a menu that includes not only beer and cocktails but also a Boozy Cinnamon Toast Crunch milkshake ($10) and an array of mac-and-cheese and French-bread-pizza creations to rival your favorite babysitter’s. The Boozy Cinnamon Toast Crunch Milkshake at Thirsty Dice. I thought the hard part would be recruiting fellow nerds to join me — but it turned out to be landing a table, given that a PAX Unplugged gaming convention was in town. We were told to expect a 90-minute wait, and that once we got the call we had to be back within seven minutes or lose our spot. (Or we could wait at the three-seat bar.) But after I abandoned a nearby dinner and power-walked back to the bar when the call came 45 minutes early — then bribed my grumpy friends with drinks — things improved. The $7-per-person “library fee” for access to the games feels steep, but it comes with not just a library of 800 board games but also personalized help from “gametenders." A chipper young board game sommelier named Morgan patiently explained the color-coded game classification system (a green dot, for example, means a game can be learned in five minutes or less), helped us select Sushi Go!, and even came over to our table to explain the points associated with collecting jolly anime sashimi and sleepy-looking dumplings. It conveniently eliminated the worst part of learning any new game: reading the directions. A couple browses the board games at Thirsty Dice, aboard game cafe. All around the spare, industrial, fluorescent-lit space were similarly contented dweebs: dates dueling over Battleship and beers; a group snacking on popcorn and gummy worms while playing a needlessly complex strategy game called the River; a four-top retreating into the Clue mansion while sipping themed cocktails like Risk, a sugary mix of cucumber-infused vodka and mint; a couple of guys with beers in hand playing a table-hockey inspired game called Klask that, judging by sound of shattering glass and the reappearance of the mops, shouldn’t be played with beers in hand. Owner Matt Hendricks concedes he’s still fine-tuning the concept at Thirsty Dice, which he’s now calling a “board game cafe" rather than bar. They serve locally roasted Herman’s coffee, and recently added early-morning hours. But even though the space is equipped with WiFi and large tables, he’s not trying to lure the freelance crowd. French bread pizzas and mac and cheese at Thirsty Dice. When to go: Anytime adulthood starts to feel overrated, or during the happy hour, which will start this month and run 4:30-6:30 p.m. It opens at 7 a.m. on weekdays and 10 a.m. on weekends, and closes at 3 p.m. Monday; 10 p.m. Sunday, Tuesday, Wednesday, and Thursday; and midnight Friday and Saturday. Bring: Your kids. Your friends who wish they were kids. What to order: The Boozy Cinnamon Toast Crunch milk shake, made with RumChata, whiskey, and cinnamon ice cream and garnished with whipped cream, is equally tasty and ridiculous. Bathroom situation: Clean, single-stall, wheelchair-accessible options. Sounds like: An echoing, 95 decibels of crashing Jenga towers and victorious shouts.